Endowed only with a devotion to reciprocity, I created this foundation in July 2014 inspired by a simple, profound question: What’s my obligation? To the music, literature, and art which nourishes me emotionally, spiritually, and intellectually. My answer is: earn it and return it. We aspire to be a force-multiplier towards greater artistic and organizational self-sustainability. We evaluate our success not by our own generosity but whether our contributions are generative. 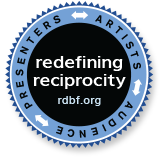 Our grants, awards and donations are individually tailored to each artist or organization we select to support. We will demonstrate gratitude, reward potential, promote hidden genius and challenge prevailing conventions. We purposely avoid a formal application process, preferring to engage in dialogue. The foundation’s funding decisions are guided by my 30+ years of immersion in visual art, music and literature, aided by the wisdom of my board and fueled by my available resources. Due to the overwhelming volume of funding requests, we are unable to respond to every query. Some grants contain requirements, others are unrestricted. Our schedule marches to the beat of its own drummer. We are irreverent, experimental, controversial enough to promote rigorous discourse, unafraid to make mistakes or offend, and humble enough to listen attentively. And so I end at the beginning. What’s my obligation? What’s yours?